Valentine’s Day is Sunday. That snuck up on us, didn’t it? 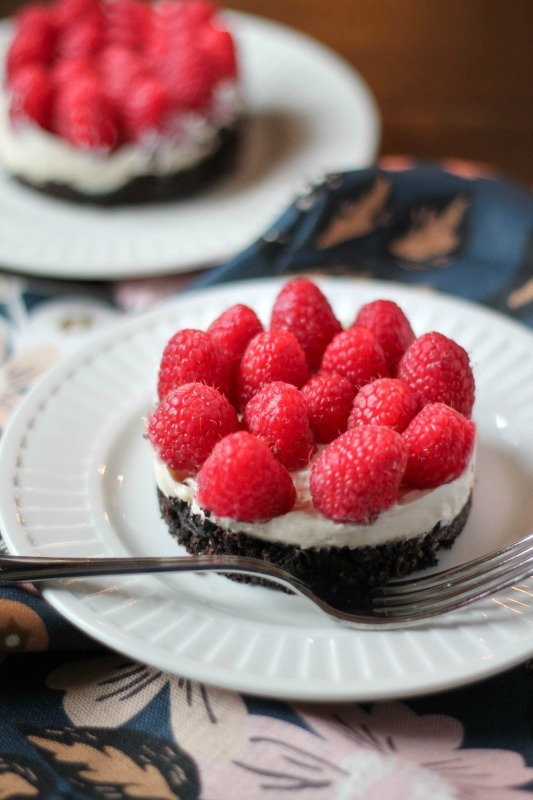 Today I have a super simple 7 ingredient, 5 minute recipe for a No Bake Vanilla Raspberry Cheesecake with an Oreo crust. 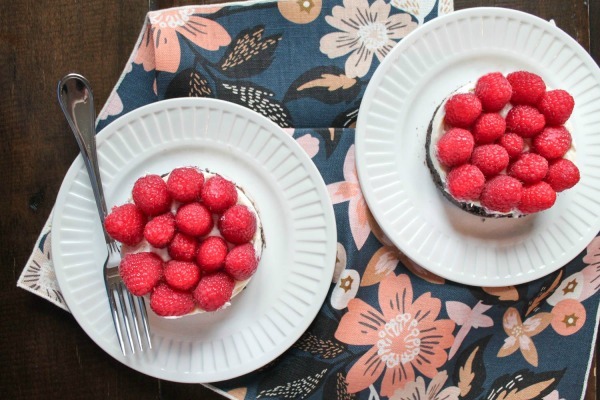 You can opt to make two individual cheesecakes, or one larger cheesecake, and you can really put any fruit you want on the top (but I thought that raspberries were festive). Charles claims that he doesn’t like sweets… but he devoured this before I could steal a bite! (Erin and I ate the first cheesecake together after lunch that day). 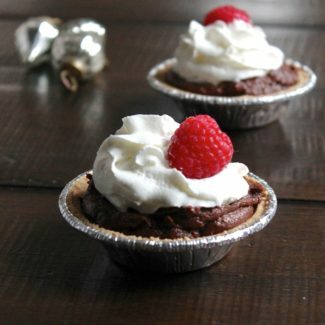 I liked the contrast of the slightly tart raspberries, the sweet smooth creamy cheesecake, and the rich chocolate crust. If you want something slightly sweeter, you could opt for strawberries instead of raspberries. 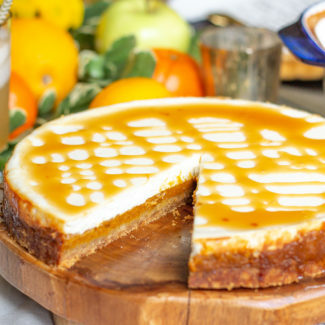 Or you could skip the fruit altogether and spread a layer of caramel on top. There is no wrong answer, only lots of easy ways to customize this cheesecake recipe based on your Valentine’s Day date’s favorite flavors. If you are wondering what to serve for dinner on Valentine’s Day, I suggest this Braciole recipe. It’s one of those recipes that looks like it took lots of effort, when the preparation time is really only 20 minutes. Plus, as it slowly roasts in your oven it will fill your home with a hypnotizingly delicious aroma. Are you planning to cook Valentine’s Day dinner at home? Or are you going out? 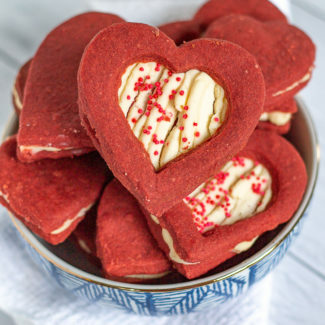 (We are going out since I prepared my Valentine’s Day recipes in advance so that I could share them with you). Pulverize the oreos in a blender. Melt the butter in the microwave and pour it over the oreo crumbs, stir to combine. Place the biscuit cutters or large cookie cutters on the center of a dessert plate. Pour half of the cookie crumbs into the center of the biscuit cutter, and press the crumbs down creating an even crust. (Or if you are using a ramekin, just press the crumbs into the bottom). 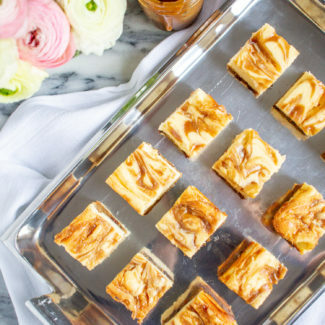 Repeat for the second mini-cheesecake. 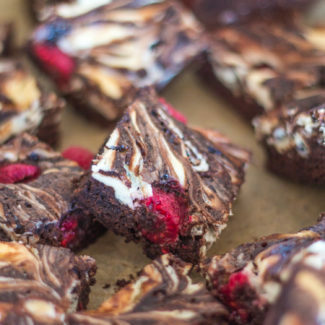 Set aside while you make the cheesecake filling. 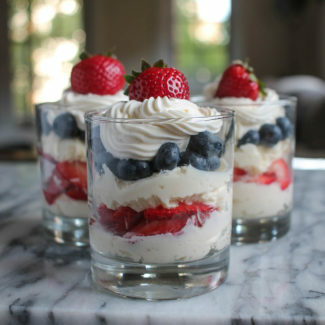 In a small bowl, combine the mascarpone, cream cheese, powdered sugar, and vanilla. Whisk to combine. Then spoon half of this cheesecake mixture over each of the Oreo crusts. 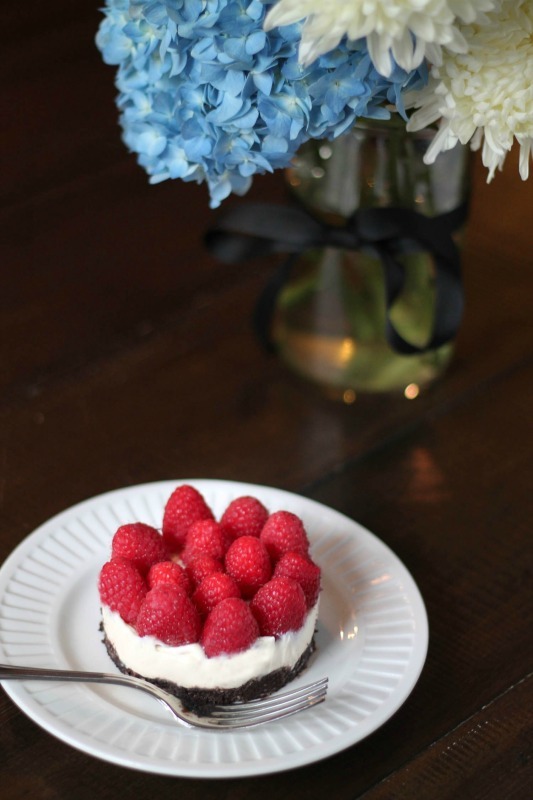 Arrange the raspberries on top of the cheesecakes. Place in the fridge to chill for at least 2 hours before serving.